There’s something wonderful about the mouth-watering aroma of delicious cookies baking on a fall afternoon! 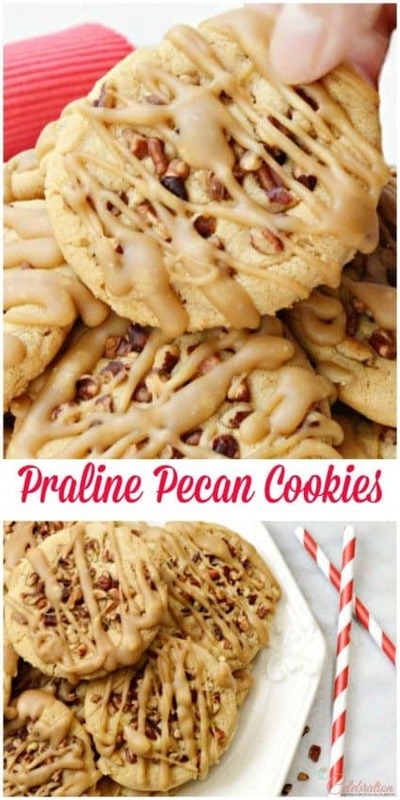 These Praline Pecan Cookies are fabulous and an easy way to kick-start your fall baking! 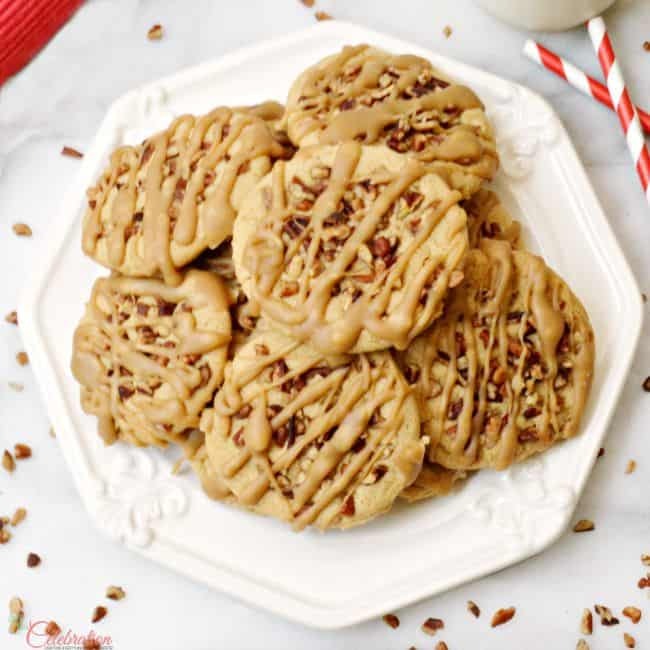 This cookie version of the classic, Southern praline candy combines a brown sugar cookie that’s both crisp and chewy, with a topping of pecans and a generous drizzle of praline icing. Hi everyone, it’s Cindy from Little Miss Celebration. Isn’t it hard to believe that summer is nearly over? We’re actually taking our vacation in a little over a week – I love being at the beach in late summer when the days are still warm but the crowds have thinned. I’m totally ready for fall when we get back! Once those cooler temperatures arrive, it’s time to turn on the oven and do some baking. Baking cookies has always seemed to be such a family and social activity! When I’m baking something complex and need to focus on absolute precision, I kind of like to have the kitchen to myself. With cookies, though, it’s like party time! Since this is a drop cookie – Moms, we love those, don’t we? 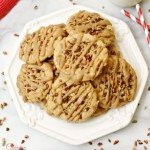 – this is a great cookie to make with the kids or with friends. The dough goes together quickly and doesn’t require any chilling. Just drop, top with pecans and bake. The finishing touch is a luscious, rich praline icing that makes a sweet finish to this fabulous cookie. 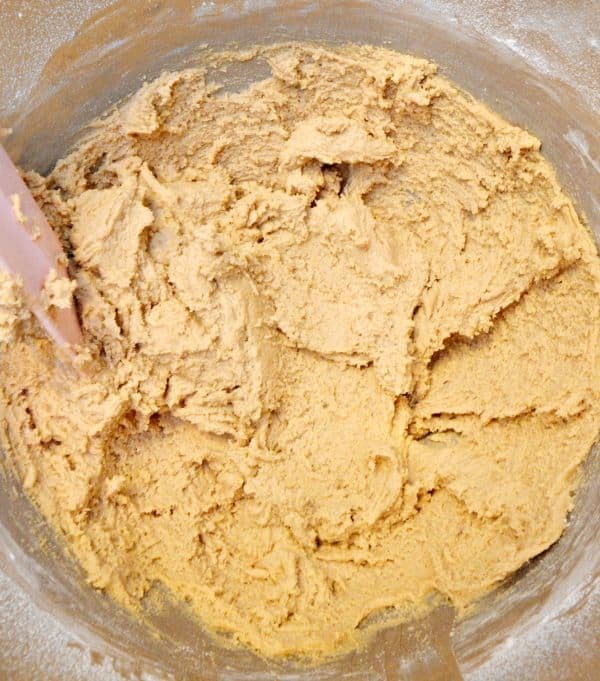 The praline icing is also very easy to make but remember to use it right away! The icing will harden quickly once it’s drizzled on the cookies. Don’t worry if the icing starts to lose its “drizzle” before you’ve finished with all of the cookies. Here’s a tip: once the icing is finished, transfer it to a microwave-safe bowl. If it starts to harden, pop the bowl in the microwave for about 15 seconds or so and stir to get it back to the right drizzling consistency. Once the cookies are iced, store them in an airtight container. The cookies will soften slightly but will not lose a bit of their delicious flavor! If you’d like to freeze them, wait to add the icing until you are ready to defrost and enjoy the cookies. You can also double the recipe – bake a batch to enjoy now and one for later. Keep this recipe on hand for the holiday season, because these make a fantastic addition to a dessert cookie tray and make a wonderful food gift! Here are a couple of other treats for the fall season starring pecans! 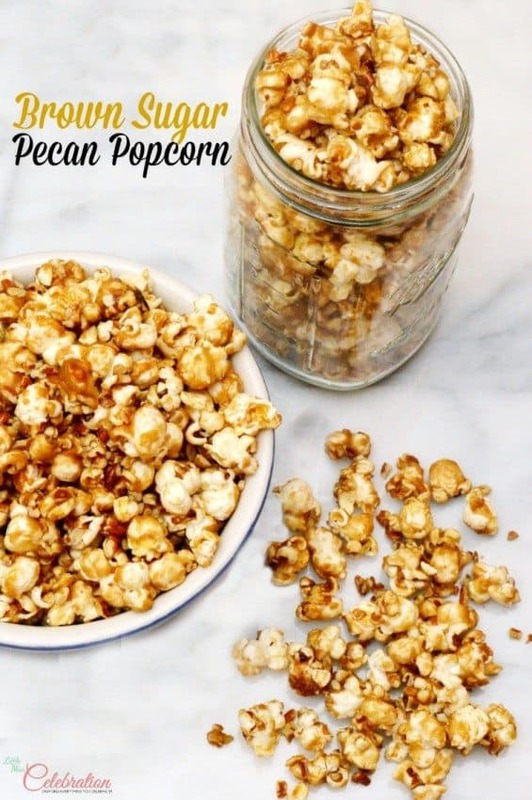 This Brown Sugar Pecan Popcorn is addictive! These fool-the-eye “Candy Apple” Cookies looks like tiny caramel apples, but they are yummy cookies dipped in caramel & pecans! 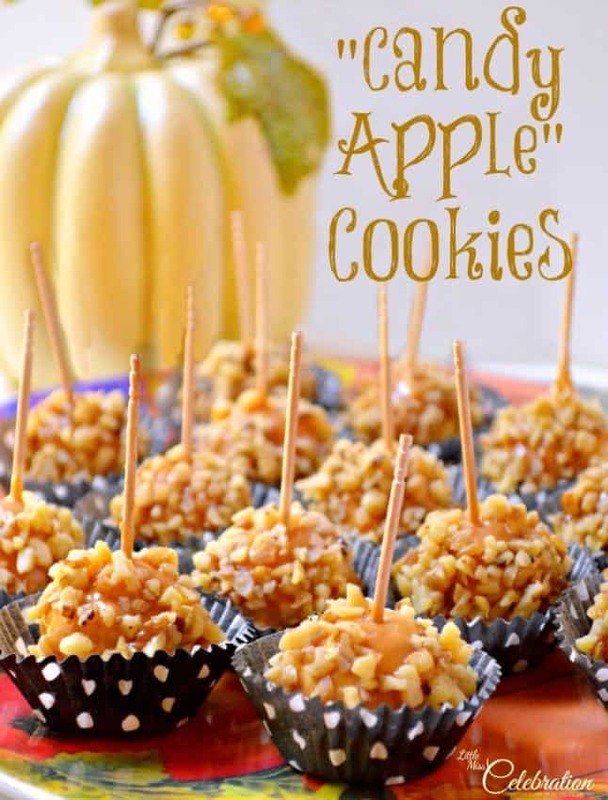 These are a Halloween/Fall must try! Enjoy the last days of summer and start your fall with a sweet treat! Thanks, Jenny, for letting me visit today! This cookie version of the classic, Southern praline candy combines a brown sugar cookie that’s both crisp and chewy, with a topping of pecans and a generous drizzle of praline icing. Preheat oven to 350 degrees. Line baking sheets with parchment paper or silicone mats. Combine flour, baking powder and salt in a bowl and set aside. In mixing bowl, combine softened butter and brown sugar. Beat with mixer and well blended. Add egg and beat until fluffy; add butter vanilla bakery emulsion or vanilla mix to blend. Add flour mixture, one tablespoon at a time, and mix until just blended. Drop dough by rounded teaspoons, a few inches apart, onto parchment lined cookies sheets. Using the back of spoon, flatten each cookie slightly. 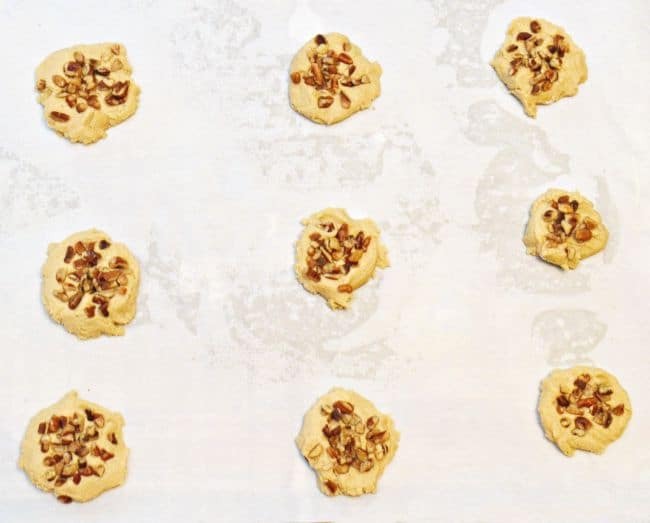 Sprinkle top of each cookie with about ¾ teaspoon of pecans, pressing pecans lightly into dough. Bake cookies until golden brown, about 10 minutes, and transfer cookies to wire rack to cool. 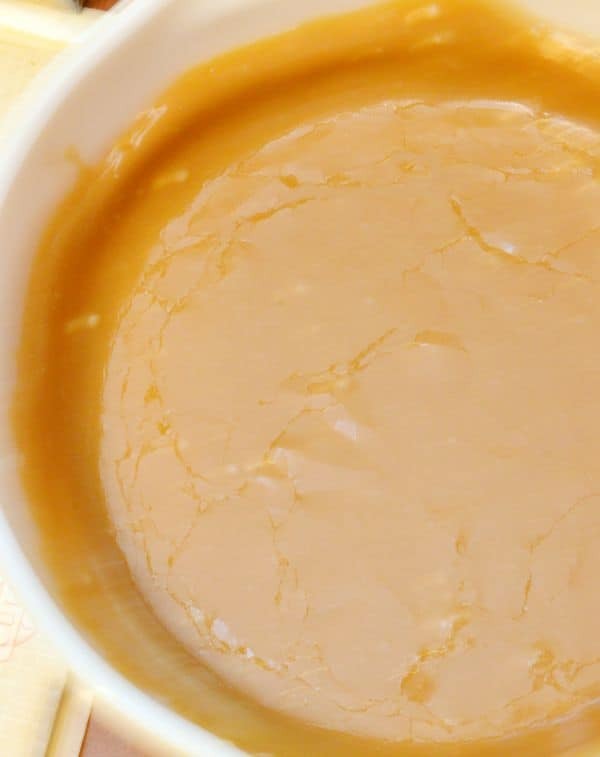 In a saucepan on the stovetop, combine brown sugar and whipping cream over medium-high heat. Stir constantly until sugar is thoroughly dissolved and mixture comes to a boil. Continue stirring and boil for two minutes. Remove pan from heat; blend in confectioners’ sugar and beat with a hand mixer or spoon until smooth – use icing immediately! Using the tip of a spoon, generously drizzle tops of cooled cookies with icing. If icing hardens and becomes difficult to drizzle, warm icing in microwave for 15 seconds and stir. Pecan popcorn and candy apple cookies! Yummy treats for a Thanksgiving kids party! I love southern pralines, so I tried this recipe. My husband and I were eating before I could get them boxed for Christmas cookies. Really easy and FANTASTIC! Thanks so much. We’re so glad you liked them!